Thanks for the article, as a parent of a very young athlete (my 6 year old son) I’ve already begun to feel the pressure, after recently being told that if I wait a few years to let him try hockey he’ll be too far behind to enjoy it! How absurd, seven years old and past his prime! I see so many parents who have their own identity closely tied to their kids’ athletic success – most kids just want to play and have fun. Excellent read! Chris, I greatly appreciate your vision in education and community sports. I am going to share this with my son as he is currently wrestling with dropping rep soccer to focus further on his basketball. He is 12 years old so it was great that you shared thoughts from your wife and daughter. Thanks! Thanks Chuck – they are hard decisions. And no doubt at some age, if kids want to play at a high level, they need to begin to focus on fewer sports. Hopefully you son can look to Steve Nash for some guidance on his basketball career – he was a really good soccer player all the way through high school! Excellent Chris. I can entirely empathize with Kim. When my eldest daughter was six and ready to play soccer I was informed she was ” washed up” as she had never played yet! Imagine! Neither of my kids ever played soccer, however, they dabbled in all kinds sports, team and solo, and we did tons together as a family with the long term goal of being active healthy adults. The only must do was to learn how to swim as that is a life saving skill. I am happy to report that thru university they played several intramural team sports and today love to do all kinds of activities from yoga, going to the gym, cycling, skiing, hiking etc. I am sure they will keep it up as it is part of their chosen lifestyle to stay healthy and fit. Goal met. Good luck out there. Yikes – nothing quite like being washed-up at 6. We do need to find more entry points for kids in sports at older ages. It seems in some sports like soccer, hockey, baseball etc. we begin to give all our attention to the elite at a young age we miss out on the opportunity to capture kids who may want to try the sport at a later age. I really enjoy reading Chris’ thoughts on education and youth sport. I believe in what he is saying. Raising life long learners and life long participants in sport is preferable to the burn out most feel in attempting to keep up with the Joneses. Enjoy… the parallels are striking! Same interesting discussions I hear other parents having about preschool & elementary education. I hear parents often quote real estate listings when making decisions about their child’s learning future. “Top school in the area!”. When most questions after that should be surrounded by why? 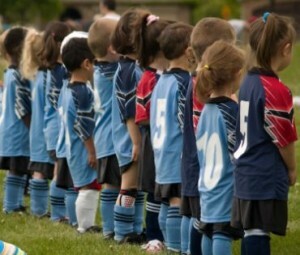 It really does make you wonder why do we do these things to kids in sport & pressure each other to do same in schools.